Brick as the most ancient building material is found almost everywhere, it is universal, beautiful, durable. 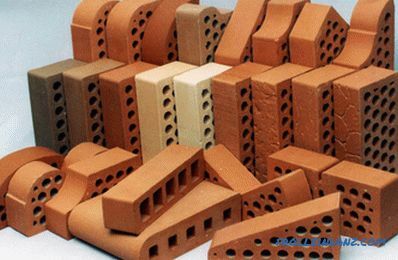 Let us try to understand in detail what types of bricks are, depending on the material of its manufacture, its scope, methods of manufacture and size. The format and composition of it is varied, this material has passed the hard way in the entire history of civilization. Each type is designed for its own spectrum of application or technological process. And the first indicator by which a brick can be classified is the material from which it is made. Ceramic bricks are made from high-quality clay without admixtures of marl and sulphates. Usually used raw materials with a minimum percentage of undecomposed calcite in the composition. 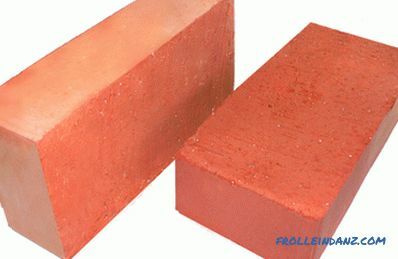 At the beginning, a brick is molded, after which it dries and is fired in a furnace at a temperature of 1000 0 C. When subjecting a brick to heat treatment, it is very important not to allow burn-up or underburning. And in the first and in the second case, the quality of the brick will significantly deteriorate. The unburned brick looks light, and the burned brick will have shades of black. A good product made of clay has a semi-gloss surface, upon impact produces a characteristic ringing sound, and has a porous structure at the break. Silicate brick consists of purified quartz rocks (sand), and lime and moisture itself accounts for about 10% of the mass of raw materials. The percentage may vary depending on the composition and quality of the prepared mass. The main condition in the production of a good product is to clean the ingredients from organic impurities, clay, manganese. Lime should not contain much calcium oxide, must not be burned. The manufacturing process takes place under great pressure. This type of brick is warmer than ceramic. 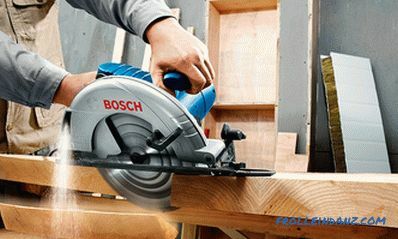 Apply it to the construction of walls and partitions. This type of brick usually includes various screenings of limestone, marble, shell rock and dolomite, which are formed during the development of open pits. These components make up to 90% of the volume of the mass of raw materials. 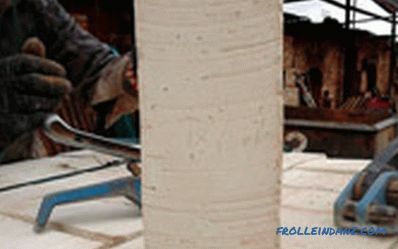 The second indispensable component of the composition is quality portland cement. It plays the role of the main binder component, occupying 6-8% by volume of the prepared mass. Creating a brick is made by pressing in special forms. Of great importance for pressing is the quality of the water itself, which is part of as a chemical reaction agent. 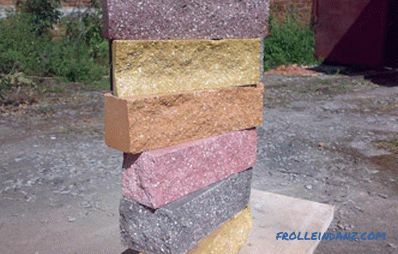 As a result of pressing, bricks of ideal shape and size are obtained. Hyper pressed bricks are used for facing the walls of buildings. The surface of the brick itself can be smooth or have a texture under the so-called "broken stone". In construction, there are several types of bricks, depending on the application. 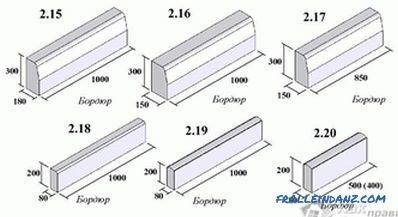 Construction or ordinary brick (GOST 530-2007 from 01. 03. 2008), used in the arrangement of both the inner walls of buildings and exterior. 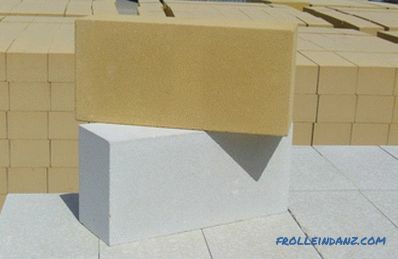 It is possible to use such types of bricks for the construction of a house, but only with subsequent warming or protective finishing of the facade. This type of brick is far from ideal and may contain small chips, which, however, do not affect its strength. 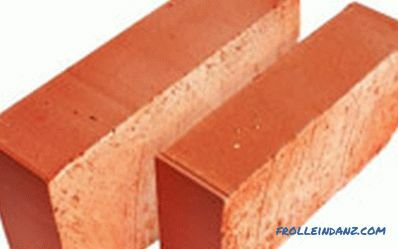 Facing brick, (other names: front, front) is the most even and perfect material free from defects. Maximum permissible deviations according to GOST are not more than 4 mm. in length, 3 mm. in width and 2 mm. on height. 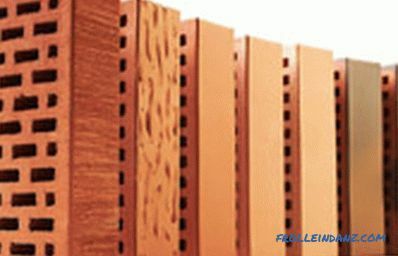 Ceramic, silicate or hyper pressed bricks can be used as cladding. The relatively low cost of facing ceramic bricks has advantages over decorative types in price. 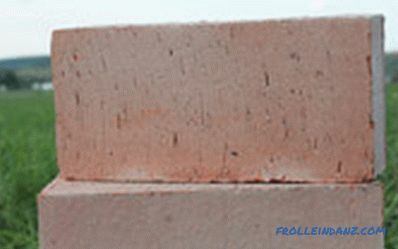 Using this brick as a facing, you should know that it is used in the lowlands and damp climatic zones, due to its low hygroscopicity. Where the use of silicate species is unacceptable due to the hydrophobic properties of the product (moisture absorption). On the contrary, in dry and hot latitudes, silicate will be the best choice of all types of facing bricks, the building is stable to temperature fluctuations, cool. Among the facing bricks, there are two types - it is textured and shaped brick. 1. 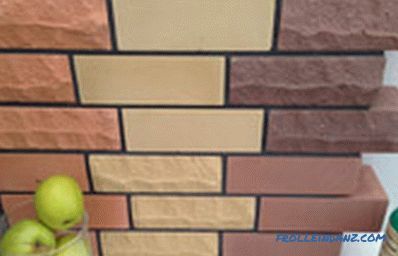 Textured bricks, with smooth or uneven edges (broken stone) are made for cladding facades of buildings and arranging fences. The edges of such a product can be, as rolled, smooth and without treatment. 2. The shaped version with different profile configurations, designed for laying complex shapes around windows, window sills, arches, pillars, fences, arbors. For example, shaped types of building bricks with round edges for corners are perfect for arranging complex building facades, namely corners. 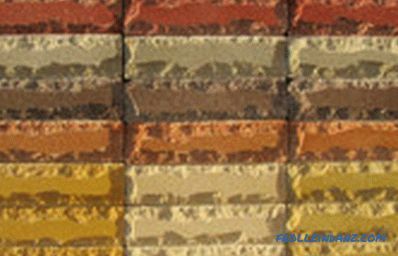 The range of colors of facing brick types is large and ranges from a light yellow shade to almost black. 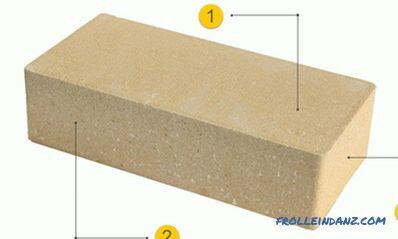 Oven, fireclay bricks, this is a refractory product according to GOST 390-96, has a regular geometric shape, granular base and may be straw-colored, with reddish or brown patches. They serve for isolation and construction of objects exposed to constant high temperatures (stoves, fireplaces). 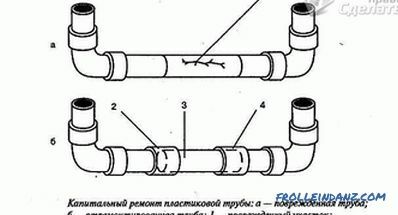 Forming a heat-resistant casing, with the function of protecting the furnace from direct fire or hot coal. The main qualities that such products should possess: heat resistance, high cyclicity, low thermal conductivity. Fireclay must withstand quite long heating and many cycles to a temperature of 1000 ° C without loss of qualities and its strength. The refractory version is made optionally in the correct form, there are other formats for such products (ShA-25 and ShA-47) - wedge-shaped. 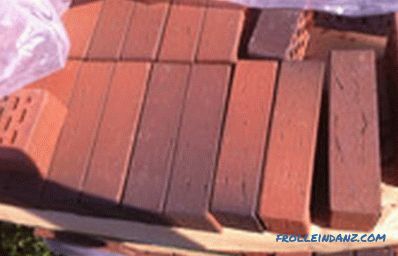 Ceramic clinker brick is made of refractory clay layers that are sintered to form a homogeneous mass. 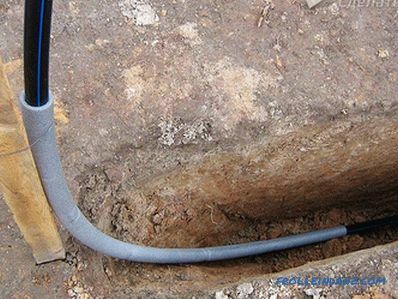 In the selection of clay mass as a source of raw materials for production are carefully. The composition of the clay should be clean and plastic, it should not be chalk and salts of alkali metals, unwanted minerals. In the process of heat treatment, clinker acquires the highest strength and good density. Low hygroscopicity and unpretentiousness to negative temperatures. 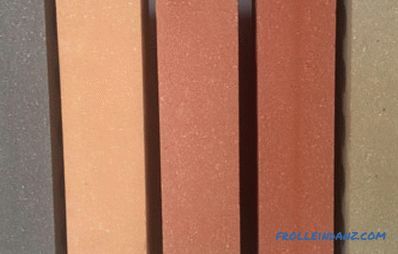 Shale clay has a suitable composition for this, it is elastic and refractory. This brick has many colors and textures. 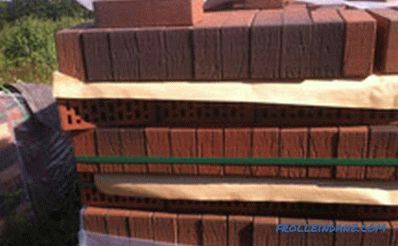 Therefore, clinker bricks are used for facing walls, plinths, and paving of garden paths. 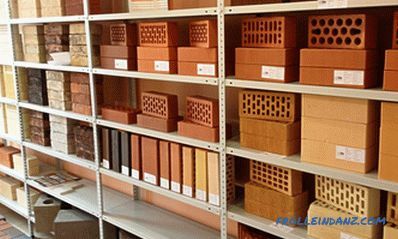 Production of ceramic bricks is divided into two main types by the molding method. Brick plastic type molding and semi-dry brick type molding. 1. 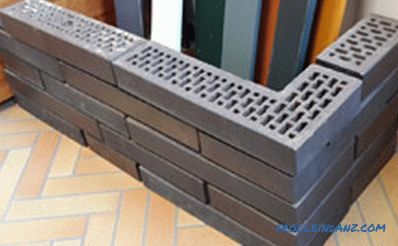 Plastic molding bricks . Plastic molding involves several processes and is performed from plastic clay masses with a moisture content of 15-21%. The main types of building bricks are made by extruding various screw presses through profile mouthpieces. There are both vacuum installations and conventional ones. 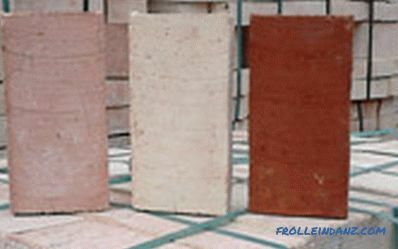 Solid stone is usually pressed on equipment without vacuum, and hollow versions - on vacuum installations and presses. 2. Semi-dry bricks . Products of semi-dry molding are also made of clay using pressing and roasting. But the main difference from the plastic method is that the raw material is previously brought to a certain humidity (about 8-14%). Then it is pressed in the forms, and only then goes to the firing in a rotary or tunnel kiln. The low humidity of the blanks, allows finished products to maintain the correct shape and a clear surface. Qualitative brick types for building a house are mainly produced by plastic molding. They have smooth edges and smooth surfaces. Depending on the filling, bricks can be hollow and corpulent. The choice of a brick will depend on the sphere and the object for the construction of which it is supposed to use it. As the name implies, such a brick has no voids. In a standard silicate product, hollowness in the form of pores does not exceed 12–13%, for the corpulent variant. In the clinker product, the porosity of the material is up to 5%. Bearing walls erect only solid brick. 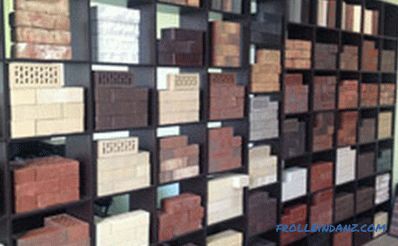 For hollow silicate brick, the hollow index ranges from 24-30%. The performance of ceramic products is slightly different. Hollowness can reach 45%. Holes or chambers retain heat perfectly, increasing the percentage of total sound insulation of walls. There is a decorative and facing brick with 4, 6, 8, and even ten chambers, both rounded and rectangular in shape. Naturally, the filling of bricks affects the strength of the entire structure being erected. Hollow variants are used mainly for the construction of partitions. Types of bricks with voids are not used in the device of fireplaces and stoves. 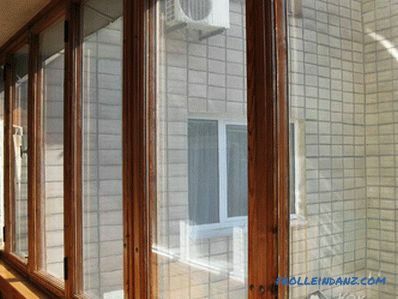 Starting to search for a suitable material for cladding or erecting walls, you should pay particular attention to the standards on the edges of the product. This will help you correctly calculate the step of masonry and choose the quantity you need. One and a half 250x120x88 mm. one. A bed is the working part of the product on which it is placed. 2. The spoon part of the stone is the face of the product. 3. Tap is the smallest facet of the product. At the end of the topic I would like to add some tips on choosing brick products. 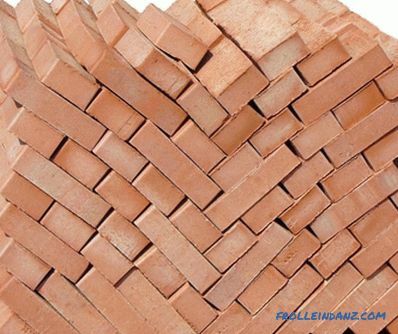 The first thing to do when choosing a brick is to find out its brand, strength, resistance to external influences. Examine already built structures or buildings from it. Find out what time the building is being used, whether there are detachments, cracks on the walls, corners. The second, and probably the most important rule, is to inspect a production or warehouse before buying for a fight, a marriage of sizes, remnants, not sold lots. The appearance of the product and the tidiness of production can tell a lot about quality.